Welcome to the January 27 Edition of the Carnival of Cities! Join us for a virtual tour of some of the world's great cities and towns with our intrepid travel writers from around the globe. Starting out in Vancouver, Canada, just in time for the Winter Olympics, Julie Ovenell-Carter shows us the Hottest tickets in town: My Top 5 picks for Vancouver’s 2010 Cultural Olympiad posted at theseboots.travel for anyone who's just not that into sports, or wants to take a break from the action to enjoy some culture. Jump in your virtual convertible and drive on down the coast to my home state of California, where Caitlin will introduce you to the real Surf City in Driving Highway 1 in California: Santa Cruz and The Lost Boys Railroad Bridge at Roaming Tales. Keep going past Big Sur and Hearst Castle, all the way down the Pacific Coast Highway, where Joanne will entice you with Newport Beach Romance posted at Newport Beach Vacation for you and your valentine. No valentine? No worries! Follow Peter Kimmich through a tour of The Best Walking Bars in LA, Part 1: Los Feliz posted at TryOurLA. Be sure to sober up before going along with Jim to the Hash House A Go Go, San Diego via Wanderlust Journey. You'll need to abandon the convertible and fly out to the Midwest, and pick up a mini-van to brave the weather in Minnesota, in order to check out Beth Blair's Family Tips for Nickelodeon Universe at Mall of America over at The Vacation Gals. No kids? My son will be glad to join you, since he loves Nickelodeon! In Michigan, Case Ernsting provides great information on Amish Furniture at Think Local Washtenaw County posted at Home and Decor, and tips on local Couples Getaways in the Midwest posted at FinditLocal411 Blog. In Kentucky, Jack for Prema Michael shows us Raven Run Nature Sanctuary, Lexington, Kentucky posted over at Eyeflare Travel Articles and Tips. Then, travel down to Texas with Tui Cameron and do a little Shark-gazing at the Dallas World Aquarium posted at Mental Mosaic: Have Blog, Will Travel. On the East Coast, Jon Rochetti tells us how the DC Flamenco Festival Dances into Town at The PlanetEye Traveler - Washington DC. Victoria gives us a Londoner's nostalgic look The Big Apple at one of my favorite family travel blogs, It's a small world after all. After you're done touring North America, head on over to The Continent, to some well-traveled roads, and a few off-the-beaten path locations that our travelers have discovered. Curious about post-war Bosnia? Look no further than Mostar: From the Ruins posted at Twenty-Something Travel, where you will see how this nation has fared since the war. On a budget? Find out ways to travel in Germany without spending your life savings with Munich Alberto's Cheap Hotels In Munich posted at Cheap Hotels Inn. For a more in-depth look at accommodations on the Rhine, Jim & Martha show us Bed & Breakfasts vs. Hostels: Bacharach posted at Wanderlust Journey. Want to save money in Scandinavia? Just follow Martin Andrews Seeking Discount Travel Deals To Explore OsloBrad Alexzander and How To Find Discount Travel Deals To Visit Stockholm Sweden posted at Globe Cheap Travel. If Rome is where the heart is, check out Sam's New !! The 10 Best Tourist Attractions in Rome Italy at Travel Welcome and Robin Locker's lovely Cul de Sac posted at the beautiful My Melange. Robin's blog gets my vote for best design this time around. For a gorgeous view of Spain, be sure to read Lena's 3 Facts: Barcelona posted at The Colors Magazine. The photos are muy fantastico! Only one stop in Asia this time around, this time a view of Old Delhi as seen through the eyes of a woman traveling alone at Cold SnapDragon. For a peek at life in Africa, Lanora Mueller shares moving account of her experiences in the Congo at Impressions of Kinshasa, posted at writing travel. Last, but not least, we certainly have to acknowledge the devastation brought by this month's earthquake to our friends in Haiti. June Tree presents some excellent advice on Haiti Relief Efforts and How To Help at The Digerati Life. I hope you will all take the time to stop by and find out ways you can help those in the greatest need right now. Thanks to all the wonderful travelers who participated in this edition of the Carnival of Cities! I look forward to reading the next edition, hosted by Family Travel Guides. Submit your blog article to the next edition of carnival of cities using the carnival submission form. Past posts and future hosts can be found on the blog carnival index page. 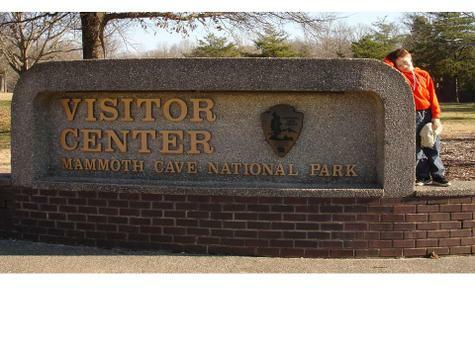 After our exciting hike through Dinosaur World, we arrived at the Mammoth Cave Lodge in Mammoth Cave National Park. The Lodge is pretty much what you would expect in a National Park Lodge. It is comfortable and a bit worn, but you just can't beat the location. Since it was off-season, the rate for a double room was about $60/night, which is a steal. We were told that in the summer, you have to book rooms a month in advance, but it's pretty slow in the winter. We were able to get in without much trouble, and it looked like we might be the only people there when we pulled into the parking lot. Aside from the rooms, the lodge features a restaurant with down-home cooking (mostly fried things with gravy), and two gift shops. One gift shop features the usual tourist trinkets and t-shirts, while the other has a nice array of hand-made items from Kentucky artisans. I bought a lovely bowl, a carved wooden spatula, and got my mom a set of fancy tea cups with fruit painted on them. At the souvenir shop, I asked the woman behind the counter if they had anything that showed that Mammoth Cave is a World Heritage Site. She eyed me suspiciously, and scowled. I wasn't sure if she couldn't understand my Ohio-via-Texas-via-California accent, didn't know what a World Heritage Site from a Willy Wonka Bar, or if she thought I said, "Do you know when the ritual human sacrifice will begin?" I asked again and she said, "We don't have anything like that," scoffed and went back to dusting the knicknacks. I guess I am the only person in the world who thinks that World Heritage Sites are cool. Outside the main lobby, there is a footbridge over a ravine to the Mammoth Cave Visitors Center, where there is another gift shop featuring books on history, geology, and conservation. You can purchase tickets for cave tours in the Visitors Center, and it is recommended that you purchase tickets in advance. Even though our tour was two days after Christmas, it sold out. Several people showed up that day and were disappointed to find that they could not book a tour when they arrived. After our early morning commando-raid shopping trip, we loaded up my Dad's SUV with provisions for our trip to Kentucky to see Mammouth Cave. My mom packed a cooler full of ham and turkey sandwiches (leftover from Christmas dinner), sodas (or "pop" as they say in the midwest), and all forms of salty carbohydrate snacks and sugary cereal that Alex loves. It was about four hours to Mammouth Cave from my parents' house. Frank wanted to educate Alex on the wonders of cave formations. I don't remember being interested in, or exposed to, stalactites and stalagmites until seventh grade earth science class, so I wasn't sure how thrilling this would be for a six year old. I also pointed out that the last time we took Alex to a cave, he freaked out, so I was not sure that this was the best idea for a boy who is still afraid of the dark. Alex assured us that he was brave enough for cave exploration, as long as there weren't any spooky bones lurking inside. Ultimately, it was Frank's birthday, so if he wanted to spend it in an underground tunnel with water dripping from the ceiling, who am I to judge? My dad, who loves a roadtrip more than just about anything else on earth, drove all the way. We entertained ourselves in the car with a few rounds of Auto Bingo and trading goofy pictures with my brother in Texas from our cell phones. After passing the Ohio River bridge into Kentucky, everyone in the car except the driver, fell asleep. Frank, my mom, and I were exhausted from shopping, and Alex will pretty much nap only when strapped into a seat for hours on end. We all woke up about an hour before arriving in Cave City and enjoyed the scenery. The weather was fairly warm and pleasant, unlike past years when we drove from Ohio to Indiana through a freezing rain storm and watched about sixty cars slide off the highway and into each other, like a giant auto skating rink. The traffic was light, and we reached our destination much faster than I expected. Exiting the highway toward Mammouth Cave National Park, we were greeted by a ginormous yellow and red dinosaur, which had a shiny, flashy appeal, like a dinosaur gone Vegas. All it needed was neon. The Vegasaurus Rex was accompanied a sign pointing the way to Dinosaur World, one of those irresistable road side attractions that mothers of six year old boys know only too well. We had seen billboard after billboard announcing the proximity of Dinosaur World, so had decided about sixty miles prior that we were stopping there.